Kona Kai is a magical hideaway, teeming with the natural beauty of old Key Largo and hand polished into one of the most exclusive resorts known to the Florida Keys. At Kona Kai, you are welcomed by the unexpected. Beauty, barely visible from the highway, makes Kona Kai "Key Largo's hidden treasure." The mood at Kona Kai is never crowded and always intimate. The eleven charming guest rooms and suites are as refreshing, unique and fanciful as their tropical fruit namesakes. Washed with natural light, tropical fabrics and original art, the overall feeling is one of elegant simplicity and perfection. You instantly feel at home, carefree and comfortable. At Kona Kai, the key is to vacation at your own pace. Sip your morning coffee and savor the ocean fragrances; stretch out on our private white sand beach; soak in the sun at the beachfront pool and jacuzzi; escape in a kayak onto the transparent blue waters of Florida Bay; heat things up with a game of tennis; tour the orchid house and tropical fruit garden or watch a magnificent sunset on Florida Bay . . . the possibilities are endless. Few resorts offer the fanciful, relaxed and intimate lifestyle of Kona Kai. Countless amenities, personalized service and the never crowded, always peaceful mood, assure your every pleasure. Discerning taste, a critical eye for detail and the gracious staff's knowledge of the ever-so-unique Florida Keys, promises to make your vacation or weekend getaway a rare and memorable experience. Located directly on Florida Bay, Kona Kai brings together vistas of an endless body of water, wide open blue skies, an international gallery of exceptional original art, lush tropical gardens and quaint cottage architecture. Kona Kai is truly a one-of-a-kind private refuge. We inviteyou to join us on your next vacation. Coastal Living Magazine: "... but the appeal of Kona Kai extends beyond its walls and gardens to the small details that indulge guests' every whim.... When the sun begins to edge toward the horizon, guests make their way to the beach and pier for the nightly Keys ritual. As orange hues spread across the sky and sea, tranquil, tropical Kona Kai seems a million miles from civilization." Fodors . . . One of the best places to stay in the Keys . . . the owners personally cater to their guests. [A Fodor's Special Recommendation.] Frommer's . . . Joe and Ronnie . . bend over backwards to accomodate guest's every need . . . It's all about personal service. The rooms, all very private are spaced out and protected by low walls of tropical trees [chosen as a Frommer's "Special Recommendation]. Florida Travel and Life . . . Kona Kai Resort & Gallery is . . . elegant, romantic and quiet, with delicate attention to the most artistic details. Judith Keith's Key West and the Florida Keys . . . The beach really is the nicest man-made white sand beach in Key Largo. Travel Holiday . . . the 11 room complex was remodeled this year and it shows. Sitting beneath the coconut palms on the beach guests see one of the Key's best assets -- never ending sky -- and, in the distance, mangrove islands marking the beginning of the Everglades. Tour boats pull right up onto the beach for excursions into the glades. AAA - Going Places Magazine A stay at Kona Kai will rejuvenate the mind and soul. Times of the Islands The spirit of Humphrey Bogart and Lauren Bacall hangs on in this intimate, restored 1940's resort tucked away on Florida Bay.... Kona Kai Resort is the kind of tranquil, aesthetic oasis achieved only by personal care and loving attention to detail. Joe Harris and Ronnie Farina have recreated Key Largo as it exists in our imaginations. Gwinnett Daily Post Paradise can be found at Kona Kai Resort in Key Largo. 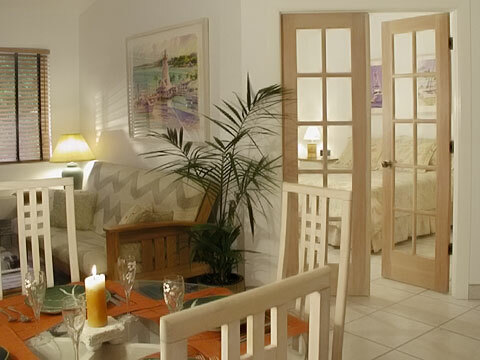 Each of Kona Kai's cottage-style rooms are unique. . . Joe and Ronnle Harris understand the need to distance one's self from the constant pressures and stress of everyday life and they have fashioned their property to relieve such tension. Discover Florida: Florida's Romantic Side Lush tropical landscape, hammocks in the sand, it's own art gallery . . . pool and jacuzzi overlooking Florida Bay make Kona Kai Resort the perfect destination for couples. Palm Beach Post . . . I fell in love with Kona Kai Resort. The owners have a real eye for detail and an intimate understanding of what frazzled guests want when they hit the island. Lush tropical landscaping, attractively decorated cottages, hammocks, pool, spa and white sand beach. Who could ask for more? Insider's Guide . . . a truly intimate gem . . . a personalized, concierge-style small resort . . . Sunday London Times Kona Kai Resort offers stressed-out urban runaways the right combination of isolation and comfort. Edmonton Journal . . . a slice of heaven. . . . American Heritage Ronnie and Joe came from New York and converted it [Kona Kai Resort] into a Keys classic . . . South Florida Wave Internet Magazine Kona Kai is outstanding when it comes to beauty, peace and tranquility. From the gorgeous, well-maintained grounds with tropical fruit trees and orchid garden to the hammocks, beautiful lounge chairs and complimentary fruit and chilled bottled water by the pool, every detail has been carefully thought out.